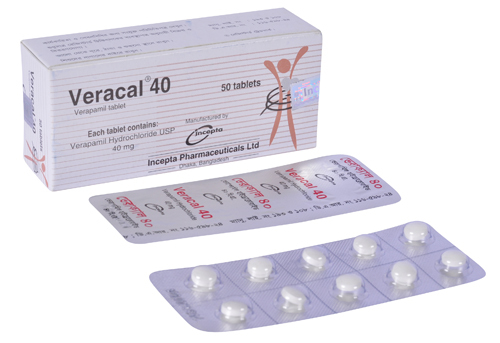 Veracal 40: Each tablet contains Verapamil Hydrochloride USP 40 mg.
Veracal 80: Each tablet contains Verapamil Hydrochloride USP 80 mg.
Veracal SR: Each sustained release tablet contains Verapamil Hydrochloride USP 240 mg.
Veracal SR 180: Each sustained release tablet contains Verapamil Hydrochloride USP 180 mg.
Veracal Injection: Each 2 ml of injection solution contains 5 mg of Verapamil hydrochloride USP. 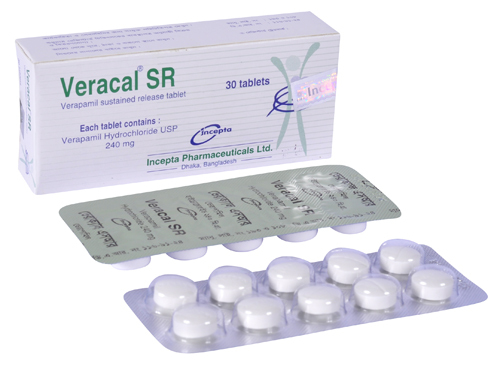 Verapamil has a pronounced antiarrhythmic action particularly in supraventricular cardiac arrhythmias. It prolongs impulse conduction in the AV node and thereby depending on the type of arrhythmia restores the sinus rhythm and / or normalizes the ventricular rate. The calcium antagonist Verapamil reduces myocardial oxygen consumption directly by intervening in the energy consuming metabolic processes of the myocardial cell and indirectly by diminishing the peripheral resistance ( afterload ). The decrease of the vascular smooth muscle tone moreover prevents coronary spasms and lowers raised blood pressure. For the prophylaxis and / or therapy of ectopic arrhythmias (predominantly ventricular extrasystoles) in halothane anaesthesia and in the application of adrenaline in halothane anaesthesia respectively. The dose of Verapamil should be individualized by titration and the drug should be administered with food. 180 mg each morning plus 180 mg each evening. 240 mg every 12 hourly. For angina the usual dose is 80 mg to 120 mg three times a day. For arrythmias in digitalized patients, Verapamil should be given 240 mg to 360 mg in divided doses, depending on the severity of the condition. Divided doses up to 180 mg/day may occasionally be needed. Adults: 5mg slowly intravenously, in tachycardias and hypertensive crises, if necessary repeat after 5 to 10 minutes. Drip infusion to maintain the therapeutic effect: 5-10 mg/hour in physiological saline, glucose, laevulose or similar solutions, on average up to a total dose of 100mg/day. of Verapamil, given intravenously, depending on age and action. The injection should be made slowly under electrocardiographic control and only until onset of the effect. Intravenous infusion in hypertensive crises: initially 0.05-0.1mg/kg/hour; if the effect proves to be insufficient, the dose is increased at 30-60 minute intervals until twice the dose or more is reached. Average total dose up to 1.5mg/kg/day. Verapamil is generally well tolerated. The following reaction to orally administered Verapamil appeared clearly drug related or occurred at rates greater than 1% in clinical trials with approximately 5000 patients. Care should be taken in 1st degree AV block, bradycardia <50 beats/minutes, hypotension <90 mm Hg systolic pressure, atrial fibrillation/flutter and simultaneous pre-excitation syndrome e.g. WPW syndrome, heart failure (previous compensation with cardiac glycosides/diuretics required). 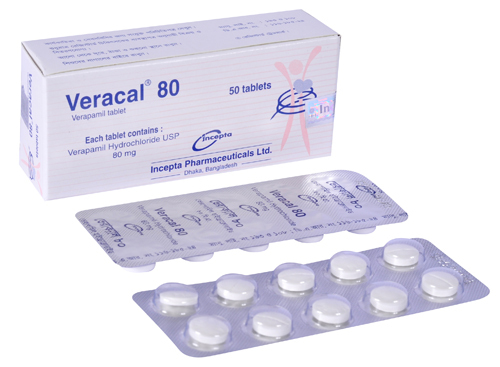 Verapamil may impair ability to drive or operate machinery, particularly in the initial stages of treatment and with concomitant consumption of alcohol. 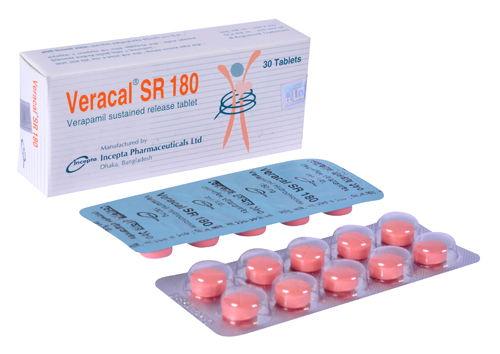 Verapamil markedly slows down the elimination of alcohol and prolongs the duration of the effects of alcohol. Verapamil should be given as a slow intravenous injection over at least 2 minutes under continuous ECG and blood pressure monitoring. Intravenous injection should only be given by the physician. Verapamil carries the potential to produce fetal hypoxia associated with maternal hypotension. 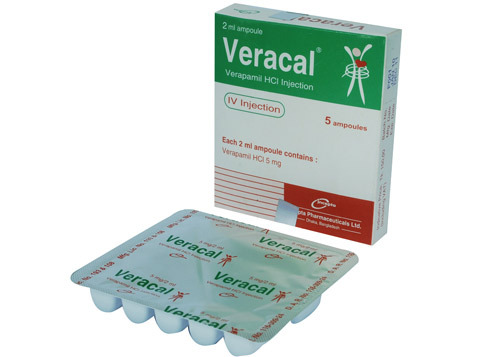 Verapamil should not be administered intravenously during the first six months of pregnancy. There are no data on use in the first and second trimester. Verapamil should not be used in the final trimester unless the benefits clearly outweigh the risks. Verapamil should not be administered intravenously during lactation. If a nursing mother requires intravenous Verapamil, breast feeding should be discontinued for the duration of treatment.